I love houses. I love the way they are built. I love the variety of house designs and styles. I love the way I can look at a house a hundred times, then look again and see something that surprises me. This site is about real houses and the people who live in them, and it's for real people, like you and me. Whether you are buying or building, or just love houses, welcome to my home. Step inside my little web-kitchen and enjoy some house talk with me. 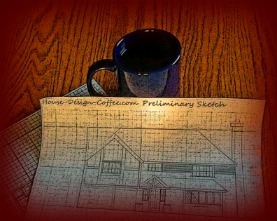 I’d offer you a cup of coffee, but this is a virtual world, so instead let me offer you a cup of house design conversation. Maybe you are confused with all the jargon. I've had the same problem and I’m glad to help. I’ve got some helpful little sections that cut through all the clutter. For instance, I have this nice little dictionary I am stocking full of architectural and construction terms. Uncertain what type of house you are looking at? Tired of not knowing one house style from another? Let me tell you a story.Years ago I was looking to buy my first house. One source I liked to peruse was a free monthly magazine showing all the local homes for sale. You know the type. You probably have one now. I was poor and just this side of broke, so everything in budget was small. And it seemed like everything I looked at was called a “Cape Cod”. But they didn’t look anything alike. As I suspected; you do know what I am talking about. Well, I got tired of not knowing what-was-what and having to take some real estate agent’s word for it so I did some research. I put all this together in the section that I call House Styles, so that you can learn and enjoy. And by-the-way, they weren’t all Cape Cods. Very few, in fact. But I did say I was inviting you in so we could talk. I am hoping we can talk a lot about all those house design things that interest me and sometimes bug me. Okay. Let me rephrase that. I am hoping we can talk a lot about those house design things that interest us. That is the way it is with a conversation. It is two way. My blog room was designed for just that purpose. So I could tell you my ideas, and you could look me in the eyes and say, ever-so-nicely, “I don’t think so”. At which point you type in your comments, or post your own article, and the conversation continues. I want to talk about house design. I want to talk about historical house styles. I want to talk about roofs and windows and the fancy little curlicue stuff on old Victorian houses. Do you prefer modern house design? We can go there. Have you ever wondered why we build houses the way we do? What is the state of the American dream home and what will our houses look like tomorrow? Are you into sustainable architecture? Have you ever built an adobe house? We have a lot of ground to cover in our conversation. I am brewing up another pot, so have another cup. Stay awhile and enjoy. And thanks for dropping in.